In my preview of Chicago's World Music Festival last week I discussed the consortium of midwestern international music festival organizers that had emerged to block book touring artists, a practice that not only defrays expenses for all involved, but makes touring the U.S. at this time of year more attractive to foreign artists. Lining up a tight cluster of gigs in a specific area is much more efficient than flying all over the country in haphazard fashion. Unfortunately, because the city dismissed fest organizers Michael Orlove and Brian Keigher last year, Chicago lacked representation at this year's consortium meetings, and further, the decision to make all of this year's concerts free of charge limited the involvement of commercial music venues. What does that mean to the average international-music fan? You can see two of the best working international acts at City Winery—tonight the Portuguese fado group Deolinda performs and tomorrow Romanian brass group Fanfare Ciocarlia play—but the shows, by two groups that are superior to most artists playing this year's WMF, aren't actually part of it, and that means you'll have to shell $18 for each. If the artists had been part of the WMF's old model they probably would've been on strong double bills that cost less money, but the current organizers seem to think it's better to present a less comprehensive program for free than a fuller and richer slate of bands for a reasonable fee. Though this remarkable Portuguese quartet plays fado, the national style of its homeland, it breaks with tradition in several ways. Most groups with a singer as powerful as Ana Bacalhau would simply travel under her name, but Deolinda maintain a band identity, emphasizing their collective approach. 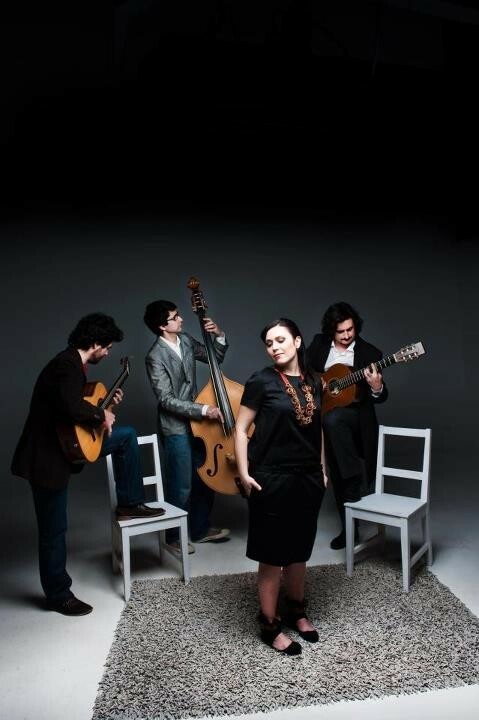 They play original material composed by guitarist Pedro da Silva Martins, not standards, and instead of focusing on songs that convey saudade—the sense of melancholy longing that's one of fado's defining characteristics—they take on a wide range of topics, from the distractions of contemporary life to the euphoric sense of promise that a smile from a passing man can inspire. On its new second album, Dois Selos e Um Carimbo (Four Quarters), the group sticks close to traditional instrumentation—two acoustic guitars and an upright bass—but branches out in other ways, adding harmony vocals, pop-flavored melodies, or a touch of flamenco. It's not easy to refashion a genre as hallowed as fado without losing the ineffable essence at its heart, but Deolinda do it so well they've become stars in the country that birthed the style. If you'd prefer their sounds to my above words you can check out the video for "Um Contra o Outro," a single from their second album, below. They perform tonight at 8 PM. Although Fanfare Ciocarlia, from the tiny village of Zece Prajini, are probably the most famous Balkan brass band on the planet next to the one led by Boban Markovic, they've only played in Chicago once before, when they tore it up at SummerDance back in 2003. Last year the band played up its friendly competitiveness with Markovic on a collaborative album called Balkan Brass Battle (Asphalt Tango), which collects individual tracks from each group with some blowouts played by both groups together. Below you can see a promotional clip made for the album and a subsequent European tour the groups did together. Fanfare Ciocarlia also play at 8 PM.